Do we have to do it again! I'll just cover my ears and then she might STOP! Oh my grandpa had a car, E-I-E-I-O…. A horn, with a beep, beep, here and a beep, beep there. Some wipers, with a swish, swish here and a swish, swish, there. A motor, with a bbbbbbbbb (lip raspberry). A radio, with a la la here, and a la la there. 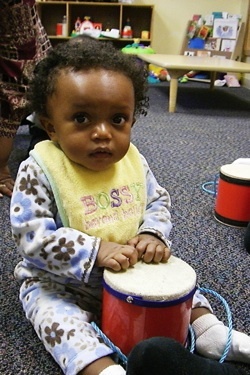 MUSIC make SPEECH and Language development FUN!! The “beep beep” of grandpa’s horn guides the child to imitate and practice the easier frontal sounds “B” and “P.” This is wonderful for the emerging talker who is just learning and fun review for those who already have it. I'm playing with my "favorite toy"...My Dad!! So, you’re thinking, “But I cannot sing!” Let me point out that it really doesn’t matter! Your children aren’t paying attention to how well you sing or even if you are singing on pitch. They are having FUN with YOU! 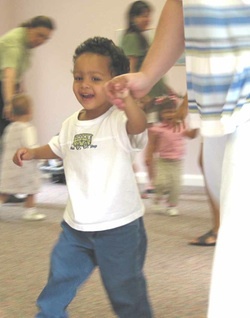 What an absolutely wonderful way to learn and gain new speech and communication skills! Grandpa’s motor is my favorite! Lip raspberries, better known asrazzies, lip bubbles, or lip trills, are a wonderful tool for the voice. As a matter of fact, every morning before I teach, I warm-up my voice with a series of lip bubbles. They help relax my lips, take pressure off my vocal chords, and focus my awareness of my diaphragm. Lip razzies do a bit of the same for your child, plus more. 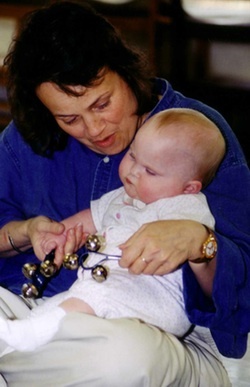 They teach and guide the child to regulate their voice, how to turn it on and off, and change its volume and pitch. For example, in order to get louder the child’s diaphragm must be engaged. 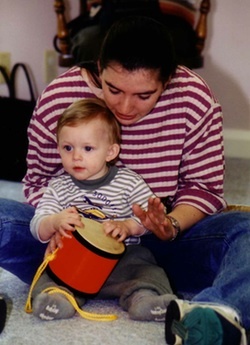 The child learns how to use the diaphragm while controlling his/her lips and tongue. They are watching your lips....."bbbbbbb" and trying to figure out "How is she doing that?" For the littler ones, lip razzies develop lip tension. This is important as our babies start eating and drinking so they will have the appropriate lip tension to create a seal for cup drinking. The jaw workout with lip razzies encourages lip development independent of the jaw and tongue, a crucial skill for eating with a spoon and eating chunkier foods. Finally, we get to Grandpa’s radio. The “L” sound can be a frequent trouble maker for beginners. The radio “La La’s” are simple and straightforward, as well as fun to sing and easy to model. 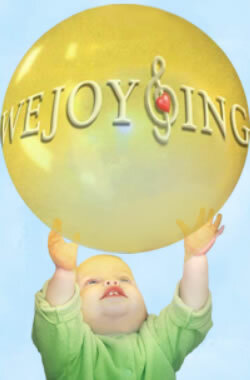 WeJoySing is all about the JOY of learning and developing essential skills through music! It’s wonderful that your child has these play-filled and motivating experiences easily built in every lesson! What a JOYFUL way to learn! So, GO and make silly sounds and sing about “Grandpa’s Car” knowing that you are laying the strong foundation for your child’s speech, communication and vocabulary!